Budget Barbie: A New Personalized Product! 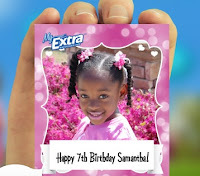 EXTRA GUM STOPPED MAKING PERSONALIZED PACKS IN FEBRUARY, 2012. YOU CAN NO LONGER GET THIS ITEM. I've always had a penchant for personalized gifts. Before the internet made it so easy to find, I would enjoy scouring magazines and catalogs to see what fun idea's I could come up with. Even when I was still a teenager myself I remember finding an ad for personalized pencils (one of the few personalized gifts you could order back then!) and got them for my little brother for Christmas. As the years went on some of the gifts I gave included personalized skate bags, belts, t-shirts, savings banks and books. More recently personalized gifts have included personalized candies, chocolate and fruit roll-ups. However I was thrilled when I was selected to receive and review a new product to personalize; gum! My family already buys and loves Extra Gum so personalizing it was simply an extra perk to a product we already liked. You can use one of their graphics or upload your own photos and messages. When it comes to the text you can adjust fonts, colors and add clip art to make each pack your own. The price is the only thing that might be prohibitive to ordering as many as you would like. Approximately $24 for 5 packages; you will have to decide if it fits into your wedding, birthday or holiday budget. 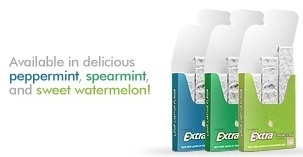 The orders come in sets of 5 and you have three flavors to choose from; peppermint, spearmint or watermelon. My initial order was placed using a photo of our family on the beach from our Spring Break vacation in March. An order of five (5) was perfect to give everyone in our family a package to not only enjoy the gum but to enjoy the photo and think of the awesome trip we had every time they pull out a piece of gum. I'm already planning a new order (not to review the product but just to enjoy it!) and with graduation, a new baby, birthdays and a few other events coming up in our lives the only problem will be deciding which event to surprise people with personalized packages of MyExtra gum will be.